How do I operate a Video Game PCB? Video game boards were designed for commercial use in Arcade machine Cabinets, either as Kits for Universal Cabinets or for dedicated Games. Therefore "User-friendliness" and easy Installation was not a big issue for the manufacturers: different adapters, current consumption, voltage adjustment or video standards, all this can present some big problems for inexperienced Collectors. We try to give you some answers to the most frequent questions here. As already mentioned in the introduction, PCBs need a lot of "periphery" before you can use them. If you have enough room at home, then you will surely go for a used Universal Video Cabinet, for instance a Merkur Vision or Twinline, or a Big screen/Goliath if you have more space, or whatever else is available and affordable. When you look after a cabinet, the most important thing is that the Monitor is working, the picture is clear and bright, and the picture tube is not to much "burned in" from years of showing the same pictures. The sharper the Images are, the better the tube is - used up picture tubes have a flat and fuzzy picture, mostly a red pass and/or too little blue. It is also important that the cabinet has a JAMMA Connector, or at least a JAMMA Adapter. Here is our list of used Cabinets. If you don't have the space to house a full size Arcade Cabinet then a MAK (Mega Arcade Console) or Supergun (same thing) is the way to go. MAKs consist of a Power Supply, a Loudspeaker, Joystick and Buttons, a Jamma adapter, and a Scart cable to connect it to your Home Television. They are available in many different brands, some of the very Spartan, others with all possible extras, ranging from cheap homebrew MAK up to the professional Supergun. Where do you get a MAK/SuperGun ? You can buy your Supergun ready-to-go here in our Webshop. The somewhat more experienced Collector/Electronics Freak can build himself, here you find all necessary parts. Ok, your Cabinet or MAK is ready to go, which Game boards can you use now? Generally, you will be able to play all PCBs offered by Arcadiabay, if not then we will note this in the Articles description. If you are using a MAK and your television set, then you should confine yourself to games with a horizontal picture, otherwise you would have to rotate your television set by 90 degrees ! Usually Universal TV cabinets have a rotating Monitor so that the Picture Orientation is not a Problem here. 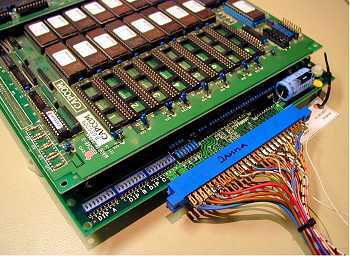 If Your MAK/Cabinet has a so-called Jamma connector (JAMMA is a connection norm for video game circuit boards and stands for Japanese Arcade Machine Manufacturers Association), then you can connect all Jamma Boards there without a problem. You find the information about the Connector on the PCB pages where picture Orientation, connection norm etc. are listed for every board. If the Description says it has no Jamma Adaptor, then you need an adapter to run this game at a JAMMA device. You can solder the Adaptor yourself ( you need a 28pin Edge Connector, a Jamma Fingerprint Board and some cables ), or you can order it with the Board, just check the little Box "Jamma Adapter" on the Boards Page. Do you like your Boards clean and shiny ? Then just check the "Wash" Button. Your Board will be cleaned in a special bath so that it looks like new. Now what's the matter with original boards and the so-called Bootlegs ? Just like today with movies and CDs there was a lot of product piracy with video games in those days. When new Baords appeared on the market then highly specialized companies in Japan (and later in Korea and Taiwan) copied the complete Hardware and offered the Game substantially cheaper than the original Board on the market. The differences were enormous: a Tetris original pcb costed about $1000,00 USD, while the copies where available for $100 USD. The Player usually noticed no difference, and the operator made more profit. Unfortunately this calculation proved to be wrong, because by the continuous tide of Bootlegs the production of Games on PCB became uneconomic for the manufacturers, they concentrated on dedicated machines and Game consoles, and so the pcb market drained. what does that mean for us today? Original PCBs are usually qualitatively better than Bootlegs. Mostly the Gameplay is 1:1 to the original, sometimes only the names of the Game is slightly changed (like time pilot to space pilot), however the picture and/or sound can be worse. As a rule of thumb we can say: The older the Game is, the better is the Bootleg. In the course of the time nearly all manufacturers had built more or less heavy copying barriers, which had to be remove by the Bootlegger - which did not always succeed without failures. So e.g. the Capcom copies (Streetfighter, Carrier Airwing etc.) have throughout problems with Grafics and sound. You need a MVS Motherboard to play Neo-Geo Modules. If you found a suitable game, then simply click on the order button, and after a confirmation screen the PCB is in your shoppingcart. From there you can continue shopping or directly go to the cashier, where our shop system will guide you through the process of collecting your personal data, shipping and payment infos. After sending the final confirmation you will receive a confirmation email, with your order listed and further Payment details. If you should have problems with the order, or something is not working as expected then you can also order by phone (05292-931616) or by email. Every PCB and MVS Module is guaranteed to be tested before we ship to you, except for the games that are marked as defective. All items which are sold expressly as defective or untested, are excluded from our warranty. Delivery will be shortly after receipt of your payment, we usually ship by DHL/Deutsche Post. You find an overview of shipping terms and prices here. Alternatively you can collect your Board here and take the opportunity to try it out directly. Complete Cabinets and dedicated Games can be delivered by a commercial transporter, freight charges within Germany are about 80 EUR. Neo Geo/MVS offers the simplest Game Installation: Power off, Swap the Modules, Power on, Done. Not quite as simple is the installation of Game PCBs. First the Edge Connector must plugged onto the Board, and it must be in the right direction. Where is top? If there is no mark on it, then you can find it out if you trace the cables: On PCBs the conducting path for GROUND and +5VOLT are always thicker and usually use 2 or more pins on the connector. The first two pins are very often attached to GROUND, then 2 pins with +5VOLT are following. Now check that the thicker cables from the adapter fit to the contact surface that we identified as GROUND /5VOLT Input. After switching the Power on you should read the +5V with a voltmeter and if necessary adjust the Power supply to be in a range from 4,9 to 5,1 Volt. Test Point should be somewhere on the PCB itself, don't measure on the Power supply or on the Adapter, because you sure loose some voltage on the way to the Board. Use the 5V/GND inputs on the Edge Connector or Pin 7/8 and Pin 14/16 on a 14/16 Pin TTL IC. Voltage adjustment should best be done after every Board swap, different PCBs have different power requirements and therefore the +5V will vary. While a small Tetris Board runs fine in your cabinet with 4.9 Volt, the voltage will drop to 4,5V or below if you plug in an Elevator Action PCB with adjusting the Power Supply. Furthermore after successfully starting the Game the picture possibly is upside down: Take a look into the DIP SWITCH plan and check if the picture can be turned by switch. If that cant be done, it gets more nasty: Some TV monitors have a second deflection plug, with which the picture tube deflection can be inverted, and with it the picture. If that cant be done also, then the sh*t hits the fan: The Cables on the deflection must be resoldered by hand - work for a TV Serviceman. If the Picture-Orientation is horizontal and your Board is vertical then check if your Monitor can be rotated, in modern cabinets monitors can be mechanically rotated from vertical to horizontal picture and vice versa. If the picture has strips, it is too small, too large, or doesn't sync: The monitor must be adjusted, on the chassis are potentiometers for horizontal and vertical synchronisation, dimension of picture area, brightness and contrast etc..
First thing you should do is to check the correct position of the Edge Connector, read the Voltage, and see if the Monitor is running ( and adjusted, if appropriate, see the Installation Paragraph for more information ). If you still have no picture, then you should insert coins to start the Game, and listen if your here the sound of the game. If so, then check the Monitor: does the picture tube heat? Is the brightness turned on? Does the Picture synchronise? Do you here a sound from the Monitor when you power it up? You should hear the crackling from the High Voltage - If not, then either the monitor gets no power or it's dead. Use a voltmeter to check if the input voltage is available (caution: 110/220Volt!). All fuses intact? If the Power is fine but still no crackling and no picture then its time to contact a TV Service. You have a picture, but no Sound: First turn on the volume on the game board, usually there is a small volume control near the sound amp. Do you hear at least a noise? Then the amplifier/loudspeaker and the wiring are correct, and the problem is more likely on the PCB. No Noise, no humming, nothing? Check if the 12Volt is there. Take a small loudspeaker and connect it directly to the appropriate pins on the board's connector. Sound? Then check cables of your cabinet, maybe there is a second Amplifier in it? Try to swap the (+) and (-) lines of the Sound output on the edge connector. Is a secondary volume control in the cabinet? do other Boards work in this Cabinet ? If everything fails then we will help you. Call us, or send email. Please understand that we can not give mail- or phone support for Boards that where not bought from us, however we do offer a repair service for such Boards. After consulting with us you can send us Boards for repair and we try to fix it for a fair price.